Today is Pi Day where we celebrate all things mathematical. Today is a super special Pi day, because a new Raspberry Pi has been released. It takes the previously excellent Raspberry Pi 3 (or 3B, to give it its full name) and upgrades it with an extra 200Mhz of CPU speed and gigabit ethernet over USB 2. It fixes many of the netboot issues which Pete highlighted at the last big Pi Birthday Party and will soon have a new smaller and cheaper Power over Ethernet HAT. 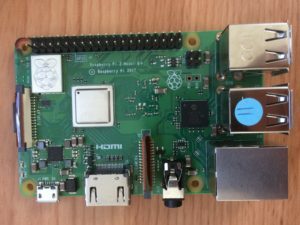 These new features are of particular interest for our Raspberry Pi Cloud service, as we use netbooted Pis, with network file storage and Power over Ethernet to enable remote powercycling. We’ve had one to play with, and we’ve run our favourite benchmark – Raspberry Pi’s own website. We installed the full stack (MySQL, WordPress & PHP7) under Debian Stretch onto a Pi 3B and a Pi 3B+, and tried it out with 32 concurrent connections. We’re running near identical setups on the two servers: both have their files stored over the network on an NFS file server and it’s the same operating system and applications; only the kernel differs. The new model is about 15% faster than the old one which is almost exactly as expected from the boost in clock speed; WordPress is CPU limited. Checksumming the 681MB database file shows up the gigabit ethernet rather effectively. All our storage is over the network so reading files is a benchmark of the network speed. This is very nearly twice as fast as the previous model. When is it coming to the Raspberry Pi Cloud? The Raspberry Pi 3B+ is an obvious upgrade for our Raspberry Pi Cloud. We need to wait for the PoE HAT to become available. That will allow us better density and lower capital costs. However, the 3B+ consumes more power than the 3B so we need to do some thermal and airflow work before we can make it generally available.